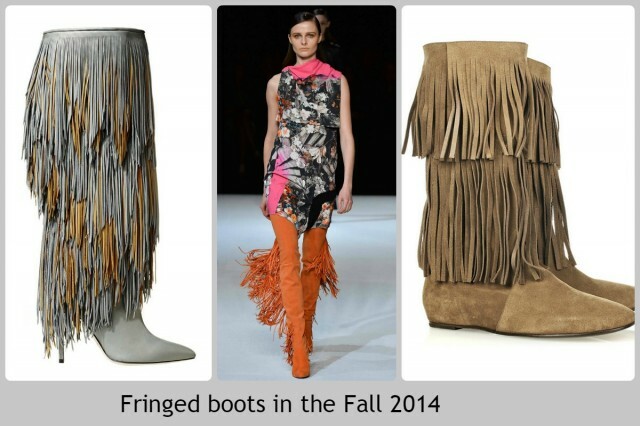 Fringe is a cute fashion trend of the Fall 2014. Fashionistas like the movement, fun and texture, which it can add to the items. Now one of the most frequent question of the fashion lovers is how to wear the trendiest style of this season in order to look stylish and up to date, but not kitschy. It’s because of the fact that fringe can be met everywhere. Designers create so many wonderful pieces using this interesting fashion element. In Fall such playful detail as fringe seem to be perfect. Fringe pieces can add some romantic and bohemian features to any outfits. Let’s see designers innovations, the ways of wearing and combining fringe items. We have seen a lot of beautiful swinging skirts and dresses on different designers’ catwalks and on the red carpet. Celebrities like this style because of its cuteness and delicate flair. Liv Tyler attended the premiere of the new NBO series “The Leftovers” in New York wearing a beautiful fringe dress by Stella McCartney. She looked fascinating. Charming Olivia Wild also likes this rend and that’s why she wore a cute vintage dress with fringe details to the CFDA Awards. Talented Jaime King also was dresses in the beautiful fringe outfit from Calvin Klein collection at the same event. Rita Ora, Kate Moss and Taylor Swift wear fringe and always look very modern and feminine. Olivia Palermo looked fabulous wearing a suede fringe skirt by Michael Kors during Fashion Week in New York this September. Now we can say for sure that fringe has made a big comeback. Because this is really the trend of Fall and Winter 2014/2015. Designers put fringed details almost to everything – from bags and shoes to dresses and jackets. Celebrities like their ideas and wear the trendy pieces with pleasure. Fashionistas search for trendy items by their favourite brands and designers. Monique Lhuillier and Pamella Roland have created wonderful cocktail dresses and evening gown using fringe. Roberto Cavalli used expensive materials and new cuts in his new collection for Fall and Winter 2014. Many fur and fringed leather pieces look magnificent and unexpected. Leather makes the fringe trend look like nobody could imagine before. 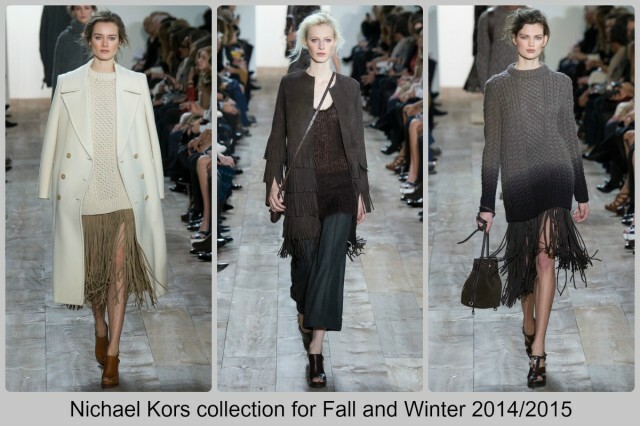 Michael Kors has shown leather fringe skirts, which will be perfect for cold fall days. Pair such skirt with a popcorn sweater and you will look marvelous. Lanvin has created an extravagant and extreme collection using a heavy dose of fringe. On spite of the unusual approach to the outfits the collection is rather wearable and stylish. It consists of lots of silk fringed dresses, fringed tops and various accessories. There are so many offers by different designers and brands in fashion world now, that it’s very difficult to make the right choice of the perfect outfit. Fringed pieces are very interesting but they are not easy at all. That’s why we want to give you some tips and tricks by a fashion stylist of One Management Corey Ng. She will tell you how to look stylish and beautiful wearing fringed pieces this Fall. The main tip is to wear one fringed thing at a time. Less can do more, because fringe is rather statement itself. Ng advices not to make your look busy and to wear your single fringe. The second piece of advice is to go modern this Fall. Combine fringed pieces with something sleek and tailored like Taylor Swift, Kate Moss and Rita Ora. Opt for fringed details and avoid full pieces. Ng explains that the trend has a strong tendency to make the figures wider and advices to choose only stylish fringed details. Fringe jacket will attract everyone’s attention this season. Whether it is made of denim, leather or suede, it is real style-street piece of the season. Combine such jacket with plain t-shirts and jeans or trousers to create a stylish and clean look. Don’t compete with the jacket in order not to look ridiculous. Fringe is rather universal. It can be applied not only to the garments but also to the footwear and various accessories from bags and gloves to earrings. You can create an amazing outfit and give an extra swing to your airy tread, finishing the look with fringed boots. This idea is great, but remember about your whole ensemble. Avoid being too bulky with other pieces of clothes. Pair your fringed boots with fitted dress or skinny jeans to look slim and pretty. If you don’t want to look like a total cowgirl, fringed bag is a perfect way to create a trendy outfit. Such bag is rather casual and can be used as an everyday accessory. You can add some western-chic element with this thing at any moment. Only think about the combination of different styles, colours and materials. Cleobella is a well-known brand which proposes different fringe bags which can suit different events. A fringe clutch with studs will be perfect for going out to any rock concert, for example. Fringe totes can also be helpful in creating the casual look. Another perfect accessory is a fringy belt. It can be added on top of dresses, skirts or pants to create a statement look. Stella McCartney offers wonderful fringe belts.